A federal grand jury has indicted 12 Russian intelligence officers for hacking offences related to the 2016 U.S. presidential election, the Justice Department announced on Friday. A federal grand jury indicted 12 Russian intelligence officers for hacking offences related to the 2016 presidential election, the Justice Department announced on Friday. The grand jury indictment, part of Robert Mueller's special counsel probe, alleges intelligence officers of Russia's Main Intelligence Directorate (GRU) hacked into the computer networks of the Hillary Clinton campaign and the Democratic National Committee, and attempted to penetrate voting systems across the country. "The internet allows foreign adversaries to attack America in new and unexpected ways," Deputy Attorney General Rod Rosenstein said in a statement before a news conference that was hurriedly called after the indictments were filed in a D.C. court. Rosenstein made the announcement as Attorney General Jeff Sessions has recused himself from any investigations into Russian interference, having been an advocate of Trump during the campaign. Trump and several Republicans have criticized that decision, as well as Rosenstein's appointment of Mueller as special counsel last year after the president fired FBI Director James Comey less than halfway into his 10-year term. Trump, meanwhile, has been criticized for being reluctant to speak publicly about Russian interference into the campaign that led to a victory he has frequently hailed, even into his second year as president. The announcement comes as Trump prepares to meet Russian President Vladimir Putin at a summit in Helsinki next week. Trump has said he believes Putin when he says that Russia did not meddle in the election. Rosenstein said the timing of the charges on the eve of the summit was coincidental and based on the collection of evidence. He stressed that no evidence of wrongdoing by Americans or campaign officials in the U.S. was found in connection with the latest indictments. Trump, as recently as today in England, has called the special counsel probe a "witch hunt." Rosenstein said he briefed Trump earlier this week about the pending indictments, though he gave no indication of the president's reaction. "I will allow the president to speak for himself," he said in response to a reporter question. The indictment alleges that Russians engaged in hacking of volunteers and employees of the Clinton campaign, including the campaign's chairman, John Podesta. Using stolen logins, it is claimed, email content and other documents were stolen, and computer activity was monitored. The domain DCLeaks.com was registered by the defendants, it is alleged. Fictitious Facebook and Twitter accounts were employed to spread information as well as the online persona of the famed Guccifer 2.0, who purported to be a lone Romanian hacker. Cryptocurrency and bitcoin mining were utilized to fund the campaign. The cyberintrusions are said to have started as early as March 2016 and continued for several months, including on July 27, 2016, when it is alleged "the conspirators attempted after hours to spearphish for the first time email accounts at a domain hosted by the third-party provider and used by Clinton's personal office," according to a copy of the indictment. "At or around the same time, they also targeted 76 email addresses at the domain of the Clinton campaign." On July 27, at a campaign appearance in Doral, Fla., Trump brushed off allegations of Russians targeting Democrats, pivoting to the allegations surrounding Clinton's use of a private email server. Rosenstein alleged members of the GRU also conspired to hack into the computers of state boards of elections, secretaries of state, and U.S. companies that supply voting software and other technology. 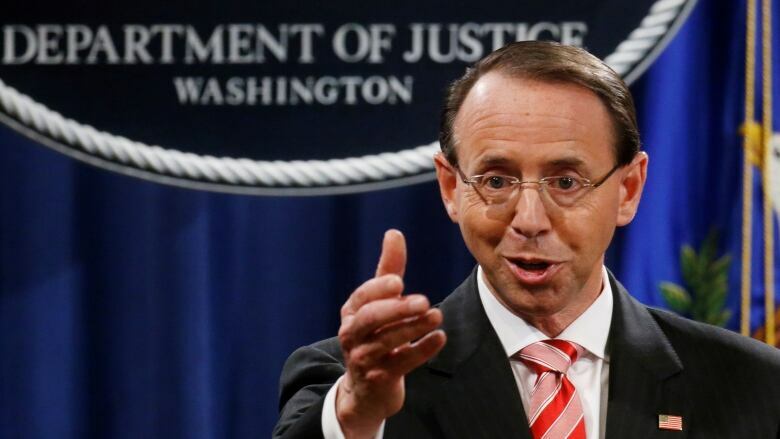 The information of about 500,000 U.S. voters was stolen after the hacking of one unnamed state U.S. election board but Rosenstein said there was no evidence that vote counts or election outcomes in any races were affected, though he warned the U.S. should "harden" its election systems against potential intrusions in a world of ever more sophisticated cyberweapons. Several current and former officials, as well as politicians from both parties, have signalled the alarm that the U.S. has been lagging on that front, as voters will head to the polls in November for U.S. congressional midterm as well as gubernatorial elections. While not willing to discuss the specifics of the ongoing special counsel investigation, the deputy attorney general appeared to take a shot at media punditry surrounding the investigation, which has been under Mueller's charge since May 2017. "The people who speculate about federal investigations usually do not know all of the relevant facts," he said. "We do not try cases on television, or in congressional hearings." Top Democrats reacted swiftly, if not in unison. Senate minority leader Chuck Schumer of New York said the Putin meeting should be scrapped, while House Democratic leader Nancy Pelosi demanded that Trump not only address the issue with Putin, but seek an agreement in writing to prevent future meddling. "President Trump must demand and secure a real, concrete and comprehensive agreement that the Russians will cease their ongoing attacks on our democracy," Pelosi said. "Failure to stand up to Putin would constitute a profound betrayal of the Constitution and our democracy." Trump, appearing hours earlier in a joint news conference with British Prime Minister Theresa May in England, said he would "absolutely" confront Putin about election meddling in their first head-to-head meeting but that he didn't expect a "Perry Mason" moment of admission from the Russian leader. Rudy Giuliani, the former Republican presidential candidate who is now an adviser to Trump, said on social media that while the indictments were "good news for Americans," they were also a sign for Mueller to wrap up his probe as the president is "completely innocent" of any accusations of collusion. Former Democrat congressman Brad Ashford, who lost a bid for re-election in 2016, said on social media after the indictment his emails were hacked. The Nebraskan agreed with Schumer in a subsequent post that the summit should be cancelled. The Kremlin repeated its denial of U.S. election interference on Friday. "The Russian state has never interfered and has no intention of interfering in the U.S. elections," said Yuri Ushakov, foreign affairs adviser to Putin. It is unlikely any of the Russians indicted would be brought to justice as the superpower adversaries do not have an extradition treaty.